Bullying. It’s on everyone’s radar these days. Whether it is physical, verbal, or cyber, it is a pressing concern for many parents and children. When it comes to martial arts schools, many claim to teach skills to combat bullies. Some, like the Gracie’s have a trademarked program called “Bullyproof” that has been featured on Oprah and other national media outlets. In reality, the basic process of all martial arts training deals with the issue. However, relevant principles are taught organically as they arise in the training process rather than in an isolated and systematized manner. Since it is sometimes helpful to present things in a systematized manner, I will liken bully prevention to constructing a building. There is the foundation, the bricks and mortar, and the tools. Hopefully, this will clarify some of the things we are already doing to address bullying and enhance it through an additional class we will offer. The foundation of any anti-bullying program starts with a profound sense of peace . The power of self defense comes not from outbursts of violence, but the precise opposite. Power comes from relaxation derived from peace. Developing this sense of ease as the foundation for any action is both the starting point and end goal of martial arts training. It is the very ground upon which it is built. Great architects built structures that naturally blended with their environment. Here the building materials used for martial arts training must reflect and lead the practitioner back to the foundation. In order to minimize the risk of being attacked in the first place, a student is taught how to structure their lives to bring a more peaceful environment. The bricks and mortar of the Aikido response to bullying are the positive charactar traits that arise from training. Through continual training, a student develops a long list of positive character traits. Some of them are: charitable attitude, ethical conduct, patience, perseverence, concentation, and an improved sense of perception which enables one to respond with precision to the real issue at hand. This is the “sowing the seeds of good karma” part of the training process. The idea is that when a person is occupied building positive traits within themselves, and sowing positive seeds in their community, their world as a whole improves. It is impossible to specify how this will play out. Perhaps the bully will not be motivated to bother with such a person. Or perhaps, the child will be insulated by his/her circle of friends. Or, alternatively, the child might not be as perturbed by insulting comments, or be goaded into a fight, because they are otherwise occupied with positive things in their lives. In any case, the development of these positive traits—the bricks and mortar—do, in fact, provide a strong and solid “house” for the Aikido student. This serves to offset or diffuse the effect that a bully has on a martial arts student. A key part of the “bricks and mortar” phase of training is the development of compassion. Bullies are people too. Hating the bully, or seeking out revenge, does not help. This brings us back to the perennial test question “Does being angry help you to defend yourself?” The kids conclude that a hateful spirit does not help, but actually weakens a person. What makes a person stronger is compassionate understanding. Knowing that a bully is acting out of a sense of insecurity …knowing that the bully needs help too…knowing that bullying says more about the bully than the victim…these are all things that an astute Aikido student will pick up on. In Aikido there is an emphasis on defending oneself without doing undue harm to the attacker. At the core of this is the realization that the attacker is behaving in a violent way because something is wrong with them, and they need help. When you have a job to do, knowing the right tool to use can make all the difference. And even better than knowing which tool you need is HAVING that tool at your toolbox (says the person who can never find the Phillips head screwdriver). Training in Aikido works in both of these areas. Perhaps one of the most important tools in Aikido is confidence. Confidence is the feeling of entitlement and ownership of one’s personal space, opinions, and rights. It is projected physically throuth posture, tone of voice (hence the emphasis on kiai), “taking the center,” irimi movement, and the physical movements of weapons training. Confidence is a complement to any technique, as a technique (or anything) executed without confidence is weak. Confidence should inform every aspect of the self defense effort. How many of us have told our young children to “use your words” to resolve a conflict? Kids are quick to resort to hitting, yelling, and pushing/shoving to get what they want. One of the first lessons we teach them is to use words rather than physical force. While this is a start, it is really only a fundamental step. The problem is that words can be as hurtful, or cause as much conflict, as physical acts. Words, by themselves, do not diffuse. The art of conflict resolution is complex, and starts far earlier than the actual verbal conflict. Should something escalate into a verbal or physical confrontation, there are tools available for those purposes as well. An Aikido student knows that violence is the last choice, and will try to resolve through talking. But a student of Aikido also learns physical techniques that involve evasive movement, throws, and pins. They learn to use their body to generate a powerful and strong base that is not easily pushed over, and that can protect themselves if need be. Although Aikido includes striking, it is not a student’s ”go to” move. The safer, less damaging techniques of getting out of the way and throwing are more appropriate for the situations children encounter. Iwama style Aikido focuses on a strong, grounded posture and extension of one’s energy. These principles help students to embody a stance that is strong and confident . If somebody is looking for an easy target, who would you think they would choose: the child who walks purposefully into the room and owns the space? Or the one who walks tentatively, slumped over, with their head down? The inner trait of confidence is reflected in the student’s outer appearance, and the physical movements of Aikido help to increase the student’s inner sense of confidence. In addition to the physical movements or verbal repsonses, any attempt at self defense must employ strategy. Strategy may be applied at both the verbal and physical level. Some of these strategies involve breaking space, inviting the attack/counterattack, and taking the center. 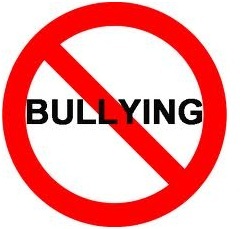 These are touched upon in the children’s classes, and will be elaborated upon in the specific bullying classes. I am just skimming the surface of the tools that Aikido provides. As one continues to train, ones’s set of tools and one’s ability to know which tool to use for which situation becomes more developed. Even though I have constructed a useful metaphor that explains the how Aikido handles bullying, the philosophy of Aikido is a holistic one. One does not train to achieve a fragmented goal, but rather to improve one’s entire life. The various goals of self-defense, fitness, dealing with bullies, improved attention span, etc. arise naturally over time as by-products of dedicated training. As a stand alone course we will be running a series of monthly “Anti-Bully” classes where we can help the children to see how their training can help them if they have to confront bullies (and any form of conflict) in their day-to-day lives. The classes will include role-playing, question and answer, discussion, strategy, and technique. “True Budo is love” – Morehei Ueshiba...was O'Sensei just some kinda hippie? Overview - Why Practice Aikido? Video...MMA fight between Randy Couture & James Toney...What strategy did Randy use?